There seems to be some confusion, in regards to the Letters Patents/Crown Grants. The titled paper has expressed that “there are limits to the legal rights” of a patentee/grantee and it is correct, but these rights and responsibilities are covered under Common Law. Common Law is to be the only “Law” between the government and the citizens. This has been supported, not only by Supreme Court rulings, but also a Professor, in 2009. The Letters Patent/Crown Grants are land/property grants given to the original settlers, which state that the contract also applies to any future owners of the property. This has also been expressed in 2011 from Ownership and Title to Real Property which can be found at the following web-site…http://lawstudies.wikidot.com/laws3112-lecture-3. “Freehold tenure is without any incidents or obligations for the benefit of the Crown. All lands granted by the Crown in fee simple are granted in free and common socage – freehold tenure. “Property is sometimes referred to as a bundle of rights. This simple metaphor provides one helpful way to explore the core concept. It reveals that property is not a thing, but a right, or better, a collection of rights (over things) enforceable against others. Explained another way, the term property signifies a set of relationships among people that concern claims to tangible and intangible items. 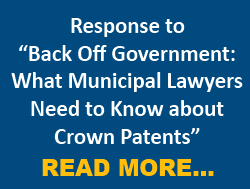 The Crown, at the time of issuance of the grant/patent can place conditions on a new grant/patent, under the Public Lands Act, but once the grant/patent has been issued it is beyond the Crown to add more conditions. It is the legislation at the time of issuance that prevails. The Public Lands Act, unless it is read and understood as pertaining to grants that are new grants/patents being issued, the statements in the paper could be misunderstood. Prior Public Land Acts have had the same criteria at the time of issuance. For example in 1853 “An Act to amend the Law for the Sale and the Settlement of the Public Lands, [Assented to 14th June, 1853]”, it was the Commissioner of Crown Lands, in other documents is was the Minister of Interior and in other documents the Commissioner of Crown Lands and the Minister of Native Affairs all had the same authorities, but it was implemented for the sale, license or lease of “Crown/Public” property and laid out the land use conditions at the time of issuance or any reservations or terms. The authority of these “Ministers” ceased at the time of issuance of the grant/patent, depending on the stipulations in the Act and the reservations. 22. The Minister has authority to determine all questions that arise as to the rights of persons claiming to be entitled to letters patent of land located or sold under this Act (**note: this means to patents that are issued today and must meet the requirements of this present Act) and the Minister’s decision is final and conclusive. R.S.O. 1990, c. P.43, s. 22. (**note: this is at the time of issuance). Patents for land commonly contain reservations and, in some cases, exceptions, land use conditions, qualifications or other restrictions. These restrictions have been imposed as a result of legislation and/or policy that prevailed at the time the land was granted. In regards to Beaches, there are in some grants/patents reservations to the Crown for some beach front, whereas in others there are not. It all depends on the grant/patent as each can be different. The following are a few cases that support “private ownership of the beaches”, and it is the grant/patent that determine the ownership. Ontario (Attorney General) v. Rowntree Beach Assn., 1994 CanLII 7228 (ON S.C.), Markesteyn v. The Queen, 2001 FCT 792 (CanLII), Supreme Court of Canada Attorney General of Ontario v. Walker,  2 S.C.R. 78. We would also like to bring up Saker v. Middlesex Centre (Chief Building Official), 2001 CanLII 28088 (ON S.C.). In this case a Saker, the private property owner, had 8 acres that he wanted to put through a natural severance by using the Beds of Navigable Waters Act, which would give him 3 acres on one side and 5 acres on the other side. Middlesex Centre used Saker’s Letters Patent against him and the statement section 17 “here, there is an express grant from the Crown of the “land and waters thereon lying”. In short, the Act does not apply. It matters not whether the waterway is navigable since the fee is vested in the grantee.” In this statement the Judge is referring to the Beds of Navigable Waters Act. Again, this would be at the time of issuance. And yet there are court cases from the beginning of this nation to present that support the patentee and the use of Common Law in conjunction with the grants. “A judgment at trial granted a declaration that the respondent company was the owner of certain lands and ordered the appellant municipality to pay damages for trespass. An appeal from the said judgment was dismissed by the Court of Appeal and the municipality then appealed further to this Court. This was really sufficient to dispose of the appeal. To summarize: Hawley had conveyed Street X long before his plan was registered; the root of title to that portion of Ontario Street shown to be under water on Hawley’s plan is the Grown grant of the 70-acre water lot made in 1876. In 1901 both properties came into the ownership of Gilmour & Co. Ltd., the predecessor in title of B.W. Powers & Son Limited, the respondent. So let’s deal with the BNA, 1867. There is a lot of reference to Section 92 and subsections 5 which gives the province the “management and sale of public lands and the timber and wood”. Then there is section 92 subsection 13 which gives the province authority over their own property and the ability for the province to protect their property in private civil courts. As Professor Irving stated in 2009. We are repeating this so that you will see that it isn’t our words, but the words of a Professor. …by the 13th paragraph of the 92nd section of the B.N.A. Act, with the power of legislation over “property and civil rights,” it follows that as a consequence all public property, which at the time of confederation belonged to these provinces and which became subject to provincial legislation, must equally belong to them. Again the above are not our words, but the words of Supreme Court Judges, Professors and the Legislators who agreed to with the Acts and statements. “Manitoba, Alberta and Saskatchewan were placed in the same position as the original provinces by the Constitution Act, 1930, 20-21 Geo. V, c. 26 (U.K.). “The case of Regina v. St. Catherine Milling and Lumber Company (1886), 13 O.A.R. 148 (SCC).” This case is still cited today, this case has to do with a permit for St. Catherine Milling to cut timber on Native Land. And it confirms that the province has jurisdiction over “Crown/Public Land”, which included “Native land under the protection of the Crown”, not granted/patented land/property. You can also refer to the Crown Lands Protection Act of 1839. The “Trusts” and “Interests” existing means Private Property not belonging to the Crown or the Province. It would seem that the Bar Report is agreeing that the Province only has the control over Public/Crown Property. Another quote from the paper is in regards to the authority of the Municipalities. “The provinces then delegated authority within areas of their exclusive jurisdiction in the Municipal Act (2001)”. It would seem, that since the provinces only have “authority” over “public/crown property” they can only delegate to municipalities, or any other corporations, “authority” over the “public/crown property” within their jurisdiction. “Mr. Mackie takes issue with the Commission’s view that his use of his property falls outside the purposes of the Act found at section 2 and the objectives of the Act found at section 8. He takes issue with the order from the Niagara Escarpment Commission. The J.P. did not have jurisdiction…plain and simple. Presently, Mr. Mackie is appealing to a court of higher competency. We hope this has cleared up any confusion, in regards to the Crown Grants/Letters Patent and we encourage everyone to seek out all of the court cases cited and the legislation. This is the only way for one to decide. Unless someone has taken thousands of hours to do the research, read the number of Constitutions, Public Land Grants Act, Real Property Acts, Court Cases, etc., there will be confusion. The information pertaining to these documents has been difficult to find and even those that we would feel should have all of this information, in relation to these documents, have not had the time to fully understand this issue. The Ontario Landowners Association is continuing to research every and all legal avenues, in regards to private property rights, and we will do our best to keep you all updated.